Who hasn’t heard of/had first-hand experience playing Doodle Jump, Icy Tower or Mega Jump? Air Penguin is similar to these storied classic games, but can it compete with them? Let’s find out in today’s review. Air Penguin is just what you might expect a jump game to be, and in that sense it’s similar to Doodle Jump and/or Icy Tower. The difference is that Air Penguin is about surviving the Antarctic by hopping from ice floe to ice floe, battling sharks, seals (uh-huh, they can be scary), crabs (dude, it’s the Antarctic, everything’s scary) and other strange ice-related occurrences. It’s only logical that when you’re enemies with seals, you’re bound to be friends with giant turtles, whales and sea stars—at least that’s how we role in Air Penguin land. The penguin can be navigated by sensor, i.e. by tilting the Android device; there are no other options for navigating the main character. Tip the phone forward and the penguin hops forward, and the more you tilt the faster/further it will jump. A few quick words regarding the game’s narrative: as stated, the penguin bounces from one ice floe to the next. If the penguin jumps on the same floe three times, the floe breaks and the penguin drowns. Hey, it’s tough in the Antarctic! Other floes are already fractured—be extra careful when jumping on those. There are also giant slabs of ice which the penguin kind of slides around on. He also has to take care to avoid seals, crabs or potholes. At the very end of an ice block a ramp leads off, and the penguin can kind of fly away as he slides down the ramp (again, everything happens via motion sensor). 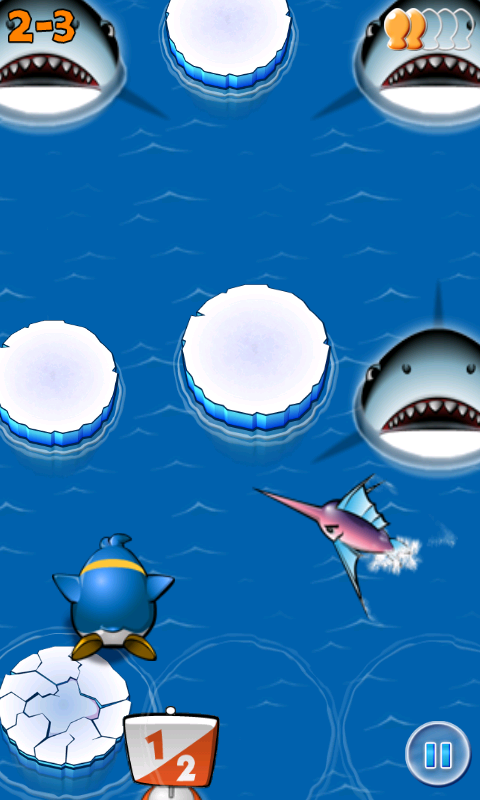 Air Penguin can be playind in two modes: the story mode and the survival mode. The story mode comprises 125 levels, and the goal is to make it in the Antarctic and save the penguin’s family from the melting poles. Oh yes, just because we’re playing games on our smartphones does not make us ignorant of disastrous consequences of global warming. Survival mode on the other hand is just about playing and getting a high score. I found the two modes to be pretty similar, despite their different storylines. Air Penguin is an entertaining and – truth be told – captivating sort of game (yes, I admit it, I was captivated by a penguin!). Not only can Air Penguin compete with classics such as Doodle Jumps, I would go so far as to say that it’s actually a better pass time. The story mode has 125 levels to offer whereas the survival mode will keep you on your toes. I recommend this game for the simply reason that I’ve been playing it for quite a while now and have not yet grown tired of it. The Air Penguin design is pretty great and the controls are awesome. That said, it does take a little while to get used to them. Air Penguin kept acting up throughout our test runs: lagging, getting stuck, becoming non-responsive. The app crashed a few times as a result of my having paused the game. Air Penguin is available for free from the Market, and it’s ice buckets of fun. There’s only a bit of advertisement at the beginning of the game, but no banner to distract you as you’re playing a round.